Pearson’s Renaissance Shoppe provides you with a lot of things you need when it comes to your costuming needs. You can either be a Medieval knight, a pirate, a gypsy, or a tavern keep. If you are a fan of the Medieval or Renaissance era, we’ve got you covered. But we also have a new section for another genre of enthusiasts: Steampunk. Steampunk is a version of fantasy that combines Victorian themes along with steam powered gadgets. If it has gears, or steam tanks, it can probably be associated with this genre. 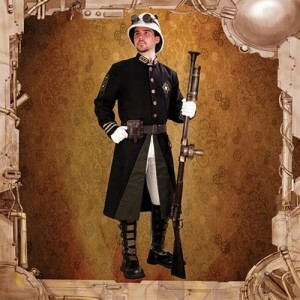 We have a new page of Steampunk costumes to help you get geared up for any type of gaming scenario, convention, or costume party. Some people really get engrossed with the Steampunk genre. For some, they actually try to create the steam-powered gadgets that you read about in the books or see in drawings. For example: This New York City apartment has transformed itself into the “Steampunk Loft.” Although we don’t offer any type of Steampunk renovations, we thought you might be interested in seeing what a living space may be like in this setting.